Glass cuvette manufacture FireflySci has released an awesome cuvette washer that is a must have for every laboratory. FireflySci Inc. is a manufacturer of quartz and glass cuvettes and is becoming the most popular glass cuvette maker in the world. The reason for their fast rise to the top is a combination of FireflySci’s unbeatable customer service, their e-commerce website, and the immense knowledge of the FFS staff. Alongside the benefits above, FFS continues to strive to work on making a researcher’s job easier and safer. In just 2016, FFS has released specialized cuvette handling gloves, tools for SRM beer experiments, and 96 well plate calibration standards. In line with the rest of these innovations, FFS has released a glass cuvette washer that makes cleaning a cell fast and easy. The FireflySci Glass Cuvette Washer is made from the finest hand blown glass. The design is really a work of art which is both pleasing to the eye and to the cuvettes. The cuvette washer has two cups on the top. One is for the cuvette with a nozzle in the middle and the larger cup is for the cleaning solution. 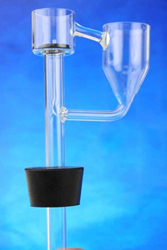 A glass cuvette is flipped upside down and placed over the glass nozzle. When the vacuum pump is turned on the cuvette is treated to a nice, refreshing clean and rinse cycle. One of the biggest benefits for buying a Glass Cuvette Washer is that scientists handle the cuvettes much less. In a typical lab, a cuvette is first rinsed, then soaked, then rinsed again, and they finally turned over to drip dry. This is a lot of handling and since cuvettes are small, they are easy to drop and break. Using a Cuvette Washer eliminates all these steps as all a user has to do is flip the cuvette over and hit the start button. Sometimes glass cuvettes can have sticky residue on them. This residue usually requires a strong chemical, such as sulfuric acid, to properly clean the cell. Now since the FFS Cuvette Washer is made from glass, it is perfectly safe to use with harsh chemicals such as sulfuric acid, plus many other chemicals. Any laboratory that has a vacuum line can easily use this handy cuvette washer. The FireflySci Glass Cuvette Washer comes with one gasket and one number seven stopper, with a glass filtering flask and vinyl tubing as an additional upgrade. To set the washer up, all a researcher has to do is place the washer on top of the filtering flask, attach the tubing to the flask and the vacuum line and they are good to go. Videos, instructions, and other Glass Cuvette Washer accessories are available on the FireflySci e-commerce website for immediate purchase.